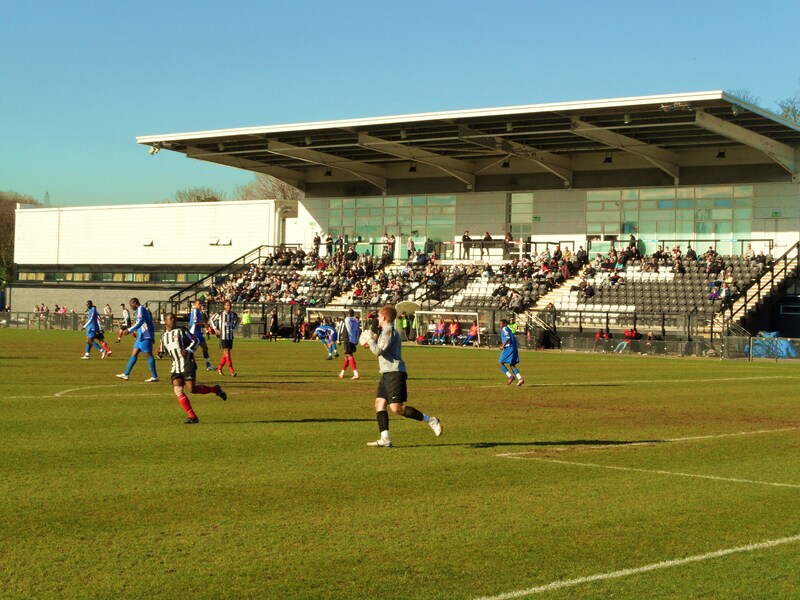 p>About Imperial Fields The club’s ground, Imperial Fields, has a total capacity of 3,500 (612 seated), and is neighboured by an AstroTurf pitch which is used for fund raising activities and teams that aid the Hub’s attempts at securing various grants to support their bid to extend profitability of the Hub at Tooting and Mitcham (The Hub at Tooting and Mitcham own Tooting and Mitcham United FC). 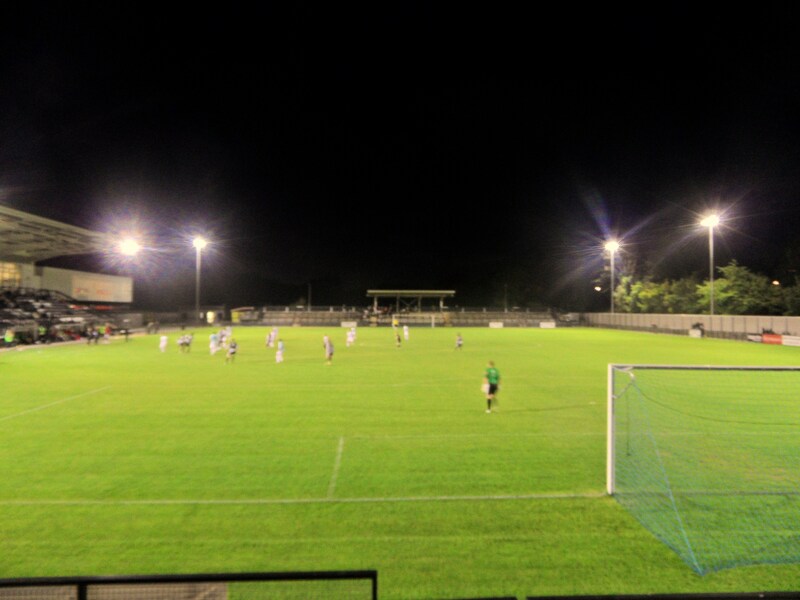 The stadium itself is a recent development, the club having moved in 2002 from a decrepit all-wooden facility at Sandy Lane in Tooting, which had been declared a fire hazard. The ground is certainly unique. One large main stand that stradles the centre of the pitch and two raised terraces behind the goal with a little roof on top. Views are excellent from most parts. On the far side of the ground there is a two step terrace that sits in the shade. Picnic benches next to the main stand complete the unique look and feel of the ground.How to get to Imperial FieldsImperial Fields is located between Rosehill and Mitcham on Bishopsford Road in Morden. A Texaco garage is situated opposite the main entrance to the stadium on Bishopsford Road. From Rosehill roundabout on the A217, take exit for Mitcham onto Bishopsford Road and drive for 3minutes down the hill crossing two sets of traffic lights. The ground is on the right at the bottom of the hill immediately before before the humpback bridge over the Wandle River. There is ample free parking at the ground. From Central London via Mitcham town centre follow signs for Rosehill and Sutton. You’ll go past major traffic lights located next to Mitcham Cricket Green and the Burn Bullock Pub. Go straight on, passing a second set of lights next to Mitcham tram station and the ground is 400 yards away on the left hand side. M25 – Junction 8 at Reigate Hill is 20-25 minutes drive outside rushhour. Take A217 and follow dual carriageway all the way, going straight on at every exit until you reach the Rosehill roundabout. Take third exit which is Bishopsford Road. Train/tramlink: The nearest station to the club is Mitcham Station on the Croydon Tramlink which is 3 minutes walk away with trams arriving and leaving every ten minutes. Simply turn left on leaving the station’s road bridge exit. Tramlink offers easy access to stations on the main rail networks including Wimbledon, Mitcham Junction, West Croydon and East Croydon. Bus: Three routes serve the stadium and stop within a minute’s walk of the stadium – 118, 280 & 210 Tube: Morden station on the Northern Line is 25 minutes walk away or an easy 5-10 minute bus journey. Buses including the 118 leave from directly outside Morden station.Admission to Imperial FieldsAdmission is £10 for Adults, £6 for Concessions and £1 for Under16’s. Programmes are available on the gate for £2.Our last visit – September 2011Don’t panic. The headline is not meant to scare anyone. It just sums up an evening of football in SM4. The Terrors in this instance refer to Tooting and Mitcham United, the Northern Line, well, that black tube line that runs down from Borough to Morden. Back from behind the sofa? Good, then I can begin. This was no ordinary midweek game for Lewes. Well actually it was. Let’s start again. This was no ordinary midweek game for the Lewes away fans. It would be the first time that the Danish fan club would be seeing The Rooks. In theory the fan club, formed back in July 2009 numbers over 60. In practice making everyone in my Copenhagen office watch a Powerpoint once a month of the highlights of Lewes’s games probably didn’t endear many of them, and I think that one or two of them may have been responsible for grassing me up for importing Marmite and thus putting in place the ban as retribution. So six weeks after I returned to the UK here I was taking a small group of them on the tube to watch Lewes play. Apparently they had been a small core of fans who missed their monthly slices of life in the English non leagues and so they used some excuse to wangle some time in the London office. 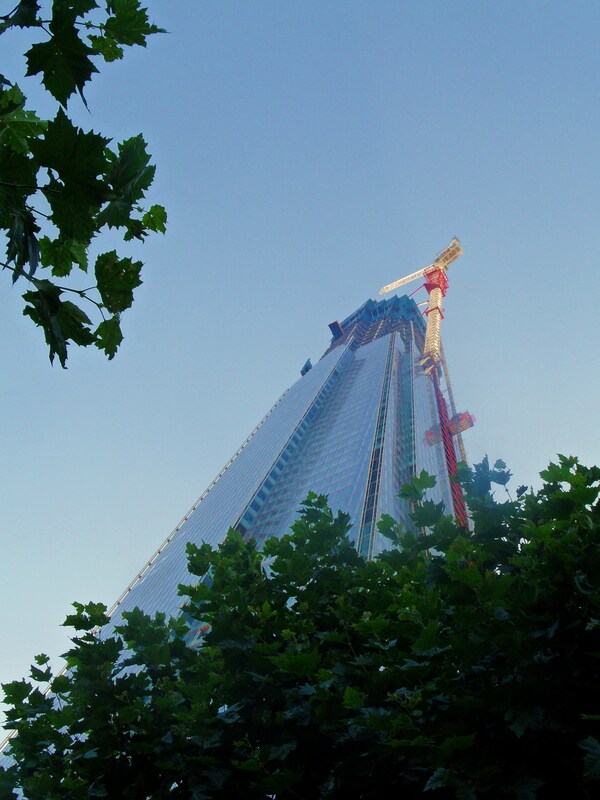 They may say it was co-incidence as they said they were really here to get up close and personal to The Shard, which is already Britain’s finest erection. And also making his debut was my Partner in Carlsberg infused Crime Ben, aka Excession1, who used to live just a stones throw from The Hub and had managed to repair his relationship to the lovely Christina since I had come home. Despite being a Spurs fan, he did know a thing or two about football and purred with excitement about seeing Nanetti in the flesh. So off we hopped after work to the Market Porter. Where else in London serves a better pint of Harvey’s Best to get us in the mood (well, apart from the Royal Oak)? It is against the law to “only have one” at the Porter and so we departed a little bit later than expected. 7pm to be precise. And one thing you have to remember is that tube and bus timetables in London do not exist. The stated 33 minute journey actually took over 50 minutes so we were not walking into the ground until ten minutes into the game.Tooting & Mitcham United 2 Lewes 2 – Imperial Fields – Wednesday 14th September 2011And what had gone on in those eight minutes we missed? In the words of Frankie Goes to Hollywood – “Absolutely nothing”. What was a pleasant surprise was the turn out from Lewes. A very impressive number of fans, and quite a few neutrals who were slowly being converted to the ways of the Rook. Game-a-day John had popped down, this being the only real option in the south, as too had Lizzy Ammon who loved our banter so much that by 9.45pm had signed up to be an owner of Lewes FC. With her was a new face. And what a lovely face to have watching our game – Sarah Flotel, aka SarahHotScores. Her video pods are legendary and I was very encouraged to see her whip out the camera at various points, perhaps for a special Lewes episode. Not that there was much to write home about in the first half. The great thing about Imperial Fields is the view you get from behind the goals. Quite steep terracing and old fashion crush barriers meant that the Lewes fans presented a wall of black and red for the team to kick towards. Even with King back on the touchline after his ban, Nanetti and Ciardini working the wings well nothing really went to plan in the first period and for the first time this season The Rooks went in at half time without scoring a goal. Results elsewhere on Tuesday night had meant that a win would take Lewes to within one point of the top of the table. However, the talk in the bar at half time was of more pressing matters. James Boyes and his fascination of going to a game by tram. As a Manchester United “die-hard” you would have thought that he had been on countless trams to get to Old Trafford but apparently not. So whilst he waxed lyrical about the nostalgic trip he had to get to the game, we disappeared to get some food. Now here is a strange thing. A football club deciding to stop selling food at the end of half time. Not after 50 minutes or an hour, but as soon as the whistle went. We had to persuade him to put on a few more burgers and even then when four more people arrived he couldn’t be arsed to cook them. With a burger in hand it was the sign for the game to come into life. Tooting, who had looked as blunt upfront as a the knives BA give you to eat your inflight meal these days all of a sudden realised that they were allowed to attack at home and from a dangerous cross that was cleared initially by Stuart Robinson but the rebound fell to Hall to drive the ball home. In the time it took us to walk around the edge of the pitch to the far end it was two nil as Hall again smashed the ball home on the volley from distance. Were the wheels coming off the Lewes machine? After all Tooting had shipped six at the weekend, yet here they were comfortably holding a lead against one of the promotion favourites. What we needed was a spark, and as if by magic it arrived. The old Ciardini/Malcolm partnership struck again, as the centre forward did all the hard work in beating defenders in the box and playing a great ball across the six yard line for Ciardini to smash it home. Just two minutes later it was all square as this time Ciardini didn’t need any help as his shot from twenty five yards took a slight deflection (although Nic claims the sound was his boot kicking the defenders – one for the dubious goals commission I think). Lewes were on top and with just seconds left should have wrapped the game up when Nanetti’s cross was met by Malcolm inside the six yard box but his effort someone managed to go over the bar. Sickening, but Malcolm has been on top form in the past few games so we cannot hold that miss that could cost us automatic promotion and a return to the Blue Square Bet South against him (Only joking MM!). Full time and with Sarah kindly offering me a lift home it was all in all a mixed evening. The Danes really didn’t know what to think, comparing it to a second level game back home, but not impressed by the lack of a sausage or two. Our growing band of neutral Rooks still hadn’t seen us win but had at least see us score, and we had gained one more owner. Bring on Chertsey and the magic of the FA Cup.March 2011 Wolfie Smith…The most lovable revolutionary in history, leader of the Tooting Popular Front. Mitcham. Named after Robert Mitchum in honour of his fine performance in the 1944 film Mr Winkle goes to War. Put them both together and what do you have? A united front, in fact a Tooting &Mitcham United. It is amazing how the longer I write, the more tenuous my introductions can get. 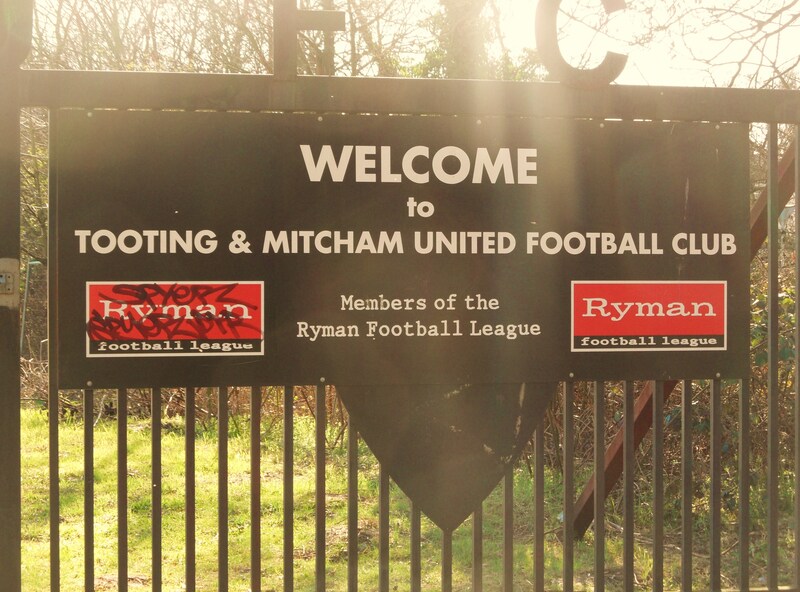 Located in a golden triangle of Ryman Premier teams, you would think that business would be booming for Ryman Premier League Tooting & MitchamUnited. Sutton United, just two miles to the south west seem to be nailed on for the title this year, and Carshalton Athletic two miles to the south east seem to be back on the way up after a season in the wilderness. So why isn’t the story from down the on Imperial Fields more positive? One of the issues is that the league is slowly being populated by teams with bigger budgets, higher attendances and a will to move up. Take the East Anglian duo of Bury Town and Lowestoft Town. Both were promoted last season, Bury from theZamaretto League as part the perennial geographical re-organisation, and Lowestoft Town from the Ryman League One. Chomping at the bit for promotion to the Premier this season is a third team from the region Needham Market, plus Whitehawk from the Ryman League South who stated their ambition by negotiating to play their games next season at Brighton and Hove Albion’s Withdean Stadium whilst their own ground is redeveloped (and of course Brighton moving to the brand spanking new AmexCommunity Stadium). Last week we launched the first part of our Non League manifesto, our agenda for change for the grass roots game. Our ten point plan is designed to stimulate some debate as to how we all can inject some life back into the lowest levels of football. Some of our ten point plan is basic common sense, but since when did common sense and football go hand in hand? So we decided to see what the fans at this level thought of some of our ideas, and what ideas they had of their own. As if I really needed an excuse to come to a game on a Saturday afternoon! After the long drive home from the TBIR Welsh office Christmas Party I did my chores, took Littlest Fuller to a party and was excused from duty at 1.30pm. As a strange quirk of fate, or more so the result of the poor weather during the early Winter, this was the second meeting between the teams in just four days. Back then, Harrow Borough came out the winners. However, it was unlikely that either team was going to be making their mark in either the promotion or relegation battle this season, so this game had a feel of an Italian end of season game, one of those where neither team has the motivation to win. Top tip of the day. Never believe SatNav’s. As the crow flies Imperial Fields lays 11 miles to the west of TBIR towers. So when TomTom tells me that the 13.1 mile journey should take 44 minutes who am I to argue with it. I neglected to look at the route it was taking me on and so nearly 90 minutes later when I was still stuck in traffic on Streatham High Road it was so tempting to hurl the useless unit out of the window. Not only did it decide to take me on the South Circular via Catford, but then down the A23 and then through every High Street in south west London known to man. 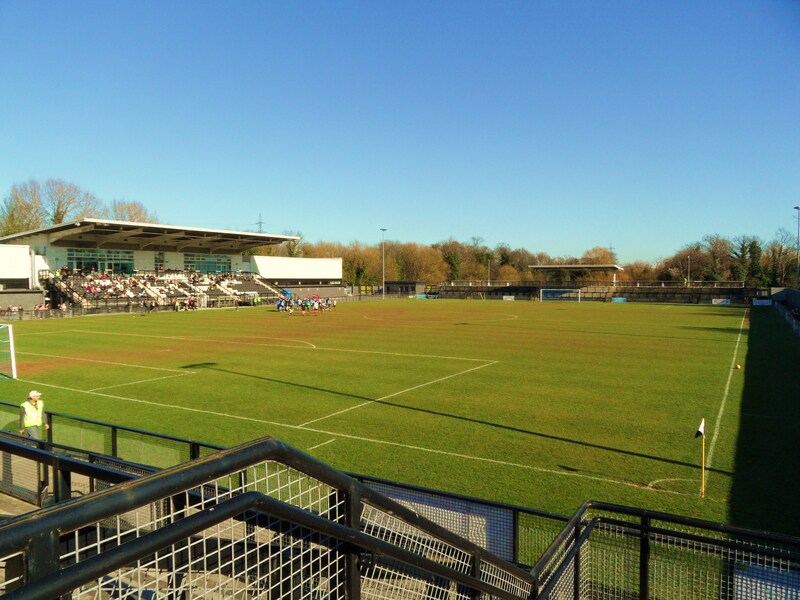 So my original plan of getting here to watch the second half of the Spurs v West Ham game went out of the window as we eventually pulled up at The Hub, the trendy name for the development where Tooting & Mitcham United now play their games at 2.58pm. Still £11 later (Nearly top marks TMUFC – surely you could let the Under16’s in for free and not extract a solitary pound off them). With the sun shining even the most basic grounds look good, but Imperial Fields is one of the better grounds I have visited this year. Sure it is modern and has a bit too much concrete here and there, but you certainly couldn’t say that the views weren’t good. One big main stand that sat astride the half way line and then behind each goal there are raised terraces who two spaceships sitting on top. The advantage here is if the game is crap you can watch the hockey on the pitch behind.Tooting & Mitcham United 3 Harrow Borough 2 – Imperial Fields – Saturday 19th March 2011 It’s rare that you get to the 89th minute of a game and have to do a double take on your watch as the time has flown so quickly. This was a cracking game that ebbed and flowed. Full of quality it wasn’t but that made it more of an entertaining spectacle. As we walked to the side of the pitch a ball was played over the top of the Tooting defence and when the ball was played across the area for an unmarked KarlMorlose to smash home. Everyone in the ground to see that Morlose was offside, and the linesman flagged accordingly. The home fans cries of “you thought you have scored” were quickly drowned out by cheers from the small travelling support as for some bizarre reason the referee over ruled his assistant and it was 1-0. A few minutes later and Morlose should have scored a second but a post somehow got in the way. This had all the makings of a rout. Tooting simply could not live with the attacking threat of Morlose and Baptiste and if it wasn’t for a smart save from Jamie Butler it would have been another. But then from nowhere Tooting found some belief and started realising that Harrow were as fragile as Mavis Riley. Big centre back Dean Marney (not the same ex-Spurs and Hull City Dean Marneywho is now at Burnley I assume) had enough on half an hour, raised his hand to ask the referee if he could go to the bathroom and never returned. Tooting took this as a good omen and started pushing the ball wide. From a corner soon after the ball fell to Reece Hall who smashed it home from twenty yards. One all. Four minutes later Pinnock got passed the full back and squared the ball and there was Jason Henry to put Tooting in front. It was so nearly three a few minutes later when three Tooting players conspired to miss from within the six yard box with the keeper already beaten. We disappeared into the bar at half time and ran into Gary, one of the veterans of the EFW/TBIR Ocktoberfest from last year, and one of the travelling party for next week’s jolly to Antwerp. The bar itself is as the rest of the group. Functional but with promise. Some comfy sofas around the edge, a big screen TV with Sky Sports, of course and plenty of space. It just needed a bit of soul (maybe a few European scarves up a la The Dripping Pan’s Rook Inn?). The second half never hit the highs of the first, although it was still as engaging. One of the Harrow directors came over to say hello, and thanked us for visiting them earlier in the season and writing a positive report. That is what I like about Non League football – people are genuine. He seemed to think that the team could get something out of the game, just as Harrow keeper Jupp spilt the ball into the path of Henry to make it three one. Oops. Harrow looked dead and buried but then as usual football has a habit of producing the unexpected. Or rather, footballers do. For some mad reason only known toOsa Obamwonyi stuck out his hand and the ball hit it. Referee Crouch annoyed the home fans for the umpteenth time in the afternoon by pointing to the spot. Rocky Baptiste stepped up and ignored the home fans chants relating to THAT miss slotted the ball home. Three two. But it was too little too late. Despite Harrow pouring forward Tooting simply used the old John Beck tactic and hoofed the ball long. And why not. A win was long overdue and gave them some breathing space from the teams at the bottom of the league. We headed back to the car along with 233 others having thoroughly enjoyed the day, if not the result (them not me). I programmed an alternative route into theSatNav. 14.2 miles – not bad. First five miles went like a dream and then we came up against a wall of Red and Blue..stupid thing hadn’t factored in Crystal Palace playing at home had it, and had taken us right past the ground. I thought these things were intelligent! More pictures from the day in the South London sunshine can be found here.